Part 4 of the Wrath of the Righteous adventure path, there's a 12th-level adventure, a look into the vast horror of the Abyss and an exploration of its many corrupted realms, an overview of Nocticula’s realm of the Midnight Isles in a gazetteer of her capital city, and more monsters. Publisher's blurb: "After an audience with the Crusader Queen, the heroes journey to a fortress that straddles the boundary between this world and the demon-haunted realm of the Abyss. There, they must face powerful agents of the architects of the Worldwound and put a stop to the production of the powerful elixirs being used to grant demons mythic power. Beyond the fortress lies the Abyssal realm of the Midnight Isles, lair of the succubus queen Nocticula - and the source of the crystals used to create the mystical elixirs. 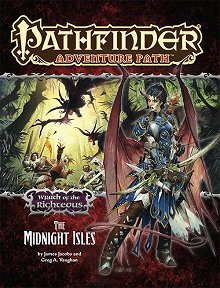 Can the heroes navigate the intrigues of the Midnight Isles to strike a critical blow for the forces of good? And can they avoid losing their souls to darkness in the process?"